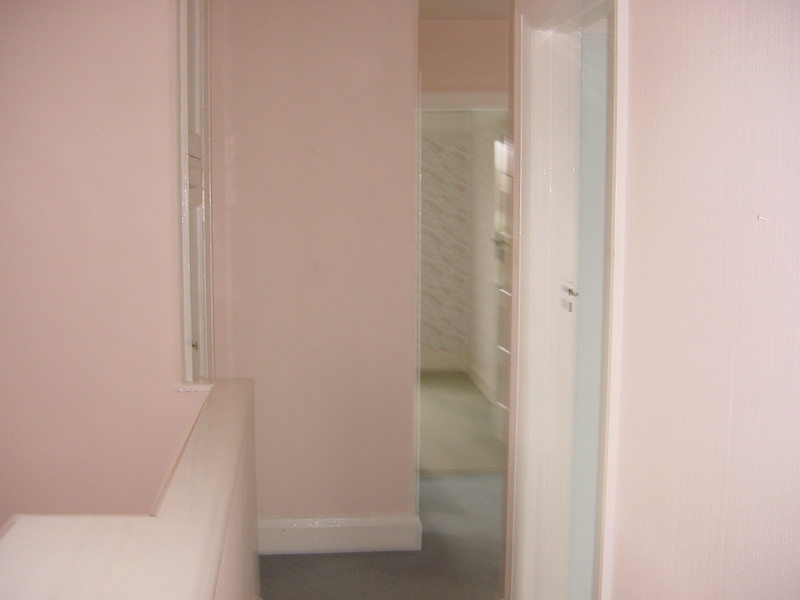 When we moved into our home the upstairs landing was a very unflattering shade of dirty pink. In the photo below you can see how it looked. On the left you can see an airing cupboard, (which has since made way to create more space in the teeny, tiny bathroom ) and the doorway to No 1 son’s bedroom ( papered in a fetching brown flower pattern) he was not amused having to sleep in there I can tell you. Filthy carpets in all the rooms, upstairs and downstairs were immediately removed. As I said in a previous post I just couldn’t bare the thought of our family sitting or playing on them ! Hubby spent many nights stripping the woodchip from these walls and plasterboarding the ceiling and walls smooth. He removed a really unflattering single light bulb which hung over the stairs and gave out little light. It took five years for us to be able to afford it, but we decided in the end that the luxury of carpet was a must for upstairs on the landing, in our bedroom and in the twins room. No1 Son preferred a wooden floor (cool mum, cool). The glass brick wall replaced the original doorway to the bathroom and the airingcupboard doorway became the new bathroom door. I thought it might look really good to have downlights running around the ceiling. This turned out better than we expected and gives a wonderful feeling to the landing space. 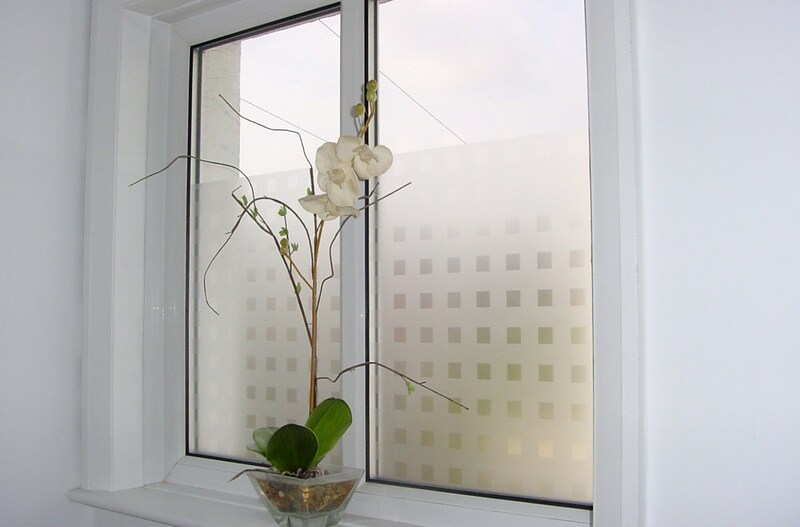 I decided to put etched window vinyl on the landing window, this meant we had maximum light into the space but still protected our privacy. I am not a lover of net curtains or blinds as they block out too much light. Light is everything to me. We even tested it at night by turning all the lights on and standing on the landing whilst my husband and I took it in turns to go outside and look up to see if we could see each other ! You have a really great eye for space and light, inspirational!! The people you bought your house from must have shopped in the same paint shop as the people we bought ours from! Gorgeous as always!Love the lighting – so effective and I am going to look into the vinyl myself – is it easy to use / remove? Hi Nicki, thank you for the comment. Yes the vinyl is great. Its relatively easy to apply, just make sure you have cut it properly to size before you peel off the backing and have little water spray bottle to spray the window before you apply it, smoothing it as you go to ensure no bubbles or creases. Not sure about removing it, we haven't tried : ) xxWe also have it in the kitchen as we are overlooked by the neighbours. Karen you are a star! I'm not a net person either but big windows = too many nosy sods lol. Love the clean look. Any recommended retailers oh interior design goddess or do I hit b&q?